So with the new house comes the LOVELY task of updating the flowerbeds. We have two. One is situated in front of the house where the garage is and the other is in front of the front bedrooms (which is also in front the house). Our house is L shaped. This is what the flowerbed looked like this past summer/fall before the winter killed everything. It was still a jungle, but it was green and colorful. This is after we cleaned up a bit but still managed to not get too deep. Front where the bedrooms are. Full of lilies. We cut back the tree in the middle to what this picture shows. This was before I trimmed the gardenias on the sides. The front flowerbed. We had to chop back the palms because they were dead. I hadn't planted anything here yet. These are from today where I currently stand with the beds. 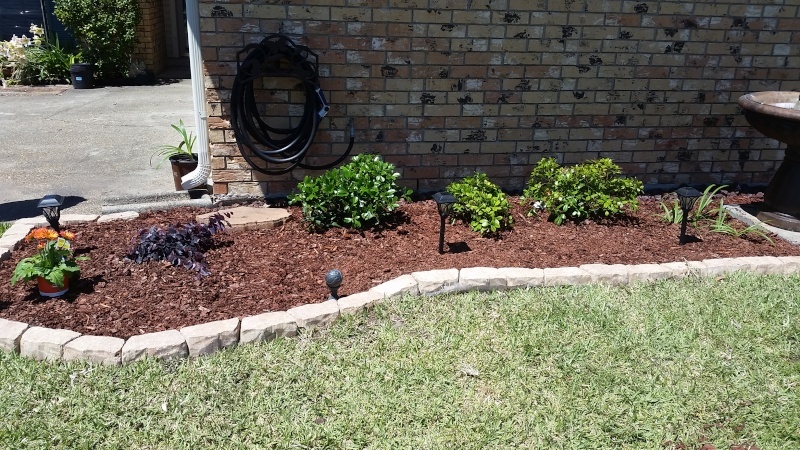 I planted a nice Madison Jasmine in place of the previous tree. My mums are coming back and I had to buy those damn snapdragons because I LOVE them. Lol. My ultimate goal is to pull up the grasses and plant them in the bed in front of the garage so we have some year round growth. I planted the delphiums near the back and the celosia as edgers because I didn't realize they were annuals but wanted some color. I'm still debating whether to dig up those shrubs because they are PARASITES. I need to put my gladiolas back in the right side and I still have to figure out what I'm doing with the rest. I am expanding it into where the fountain is and I want to plant the lily of the nile (?) near the fountain. We are also trenching and will actually create a border with some brick pavers or something soon to contain the beds. There is just so much mulch and there's not enough room to work in without everything falling out. Oh how exciting! the garden looks beautiful Have you considered adding some edibles? I live in an apartment with a south facing sunroom so I decided to start an edible container garden this year. Thank you! It still has a long way to go, but I'm liking how it's looking so far. Now, maybe it won't keep out the huskies but I do know that using pine cones for mulch will deter most cats - at least it did here. 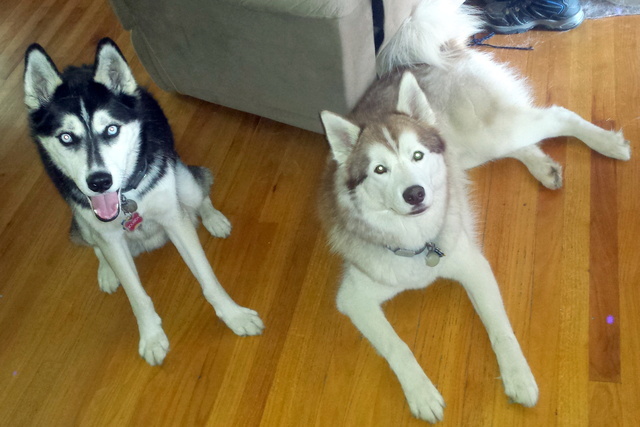 We used to have a terrible feral cat problem here(the only house without a dog!) I used single layer with cones touching each other on all sides - like a mat. But still lets air and water to the soil. Your garden is looking really nice so far! We've recently put several fruit trees around our yard and we also have several rose bushes. We have LOTS of potted plants around our porch and our front yard. We like to keep them nice all year round so when it starts getting cold, we bring in the potted plants inside the house at night lol. Then we take them out in the morning and people are always asking how we have nice flowers in middle of the winter haha. Maybe I'll post some pics later this week. So here is the soon to be next project. 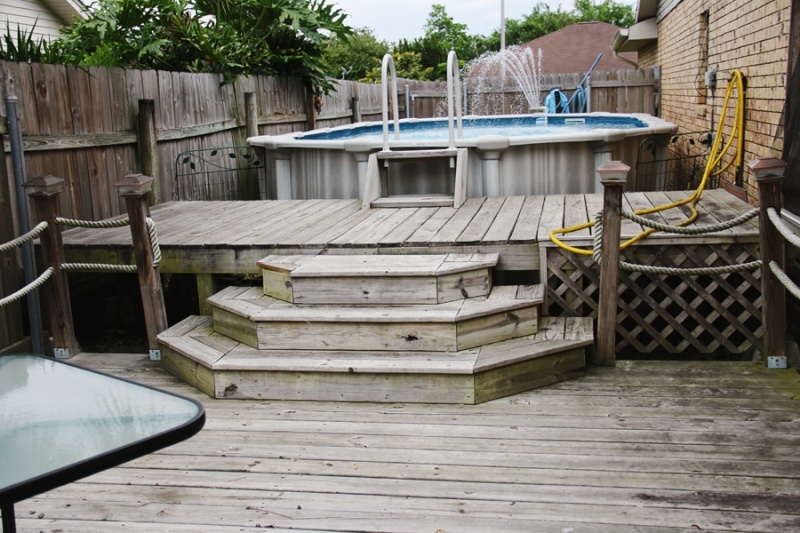 Our backyard was really nice when we first bought the house but since the dog and the underestimated amount of time it takes to keep it up, it's been neglected. Ohhh it will be exciting to see how it goes! I've never seen your garden til now, it's very pretty in the front! I like the brick on the house. It will be interesting as neither of us are very handy. Lol. Thanks, Jimmy! Nothing compares to yours. You have a beautiful garden. Our front garden is actually a mess right now. Our palm trees died so we had to cut them down. :/ I have plans to completely redo the bed but we've been so busy we haven't had time to do anything with it. No, don't say that, your house and garden is VERY cute!!! Very few gardens are perfect all the time, like here we are in a drought and can only water 3 times a week so there are a lot of browning lawns and that kind of thing. Many are re-doing their yards right now with xeriscapes. Anyways, I really like your garden! And...thank you!!! 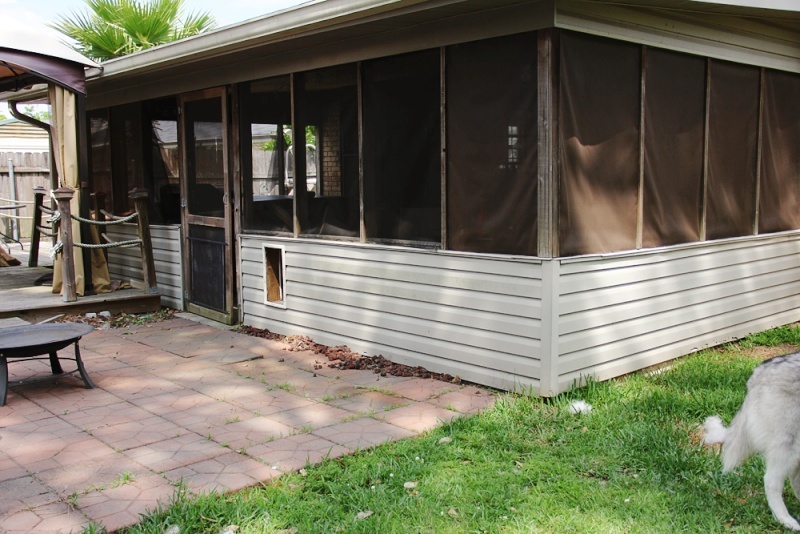 In the back, do you use your screened patio much? We don't use it a ton like I wish. Half the time our outdoor chairs are in the house for George's friends when he hosts game night. Lol. I do like to go sit out there with my coffee when the weather is nice. I've thought about removing all the screens and just having it open but the bugs are terrible down here and would be even worse without anything up to keep them out. Future plans involve installing ceiling fans but I have to call in an electrician because we have NO outlets on the back side of our house so we have to get lines run. Ahh, ok, that makes sense with the bugs. This house had one and it was made into part of the house, it increased the living space and since the bulk of the framing was already done, not much was needed to make it part of the house (it's now my dining room! LOL) then a covered patio was made in the backyard by the pool so I still have outdoor living space . I was gonna suggest that for you, haha, but yeah, you really do need the screened in to prevent the bugs from getting to you. I like the deck and your ideas for it. So after everything died the winter before last, I hadn't touched my garden. I would pull things up here and there but for the most part I just kind of let it go. Fast forward to this past fall, I decided to rip up what remained. I tore out the four o'clock bloomers and every little seedling that would shoot up after that. Anything that came up, I just dug up. 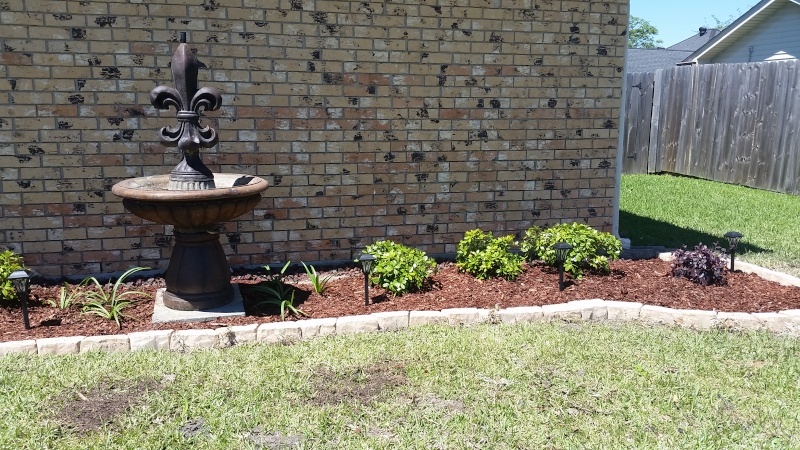 This past weekend, with the help of my mother, we finally tackled the best and redid the entire flowerbed. We raked all the weeds, dug up the palm tree roots, moved the fountain, and tilled the entire flowerbed. 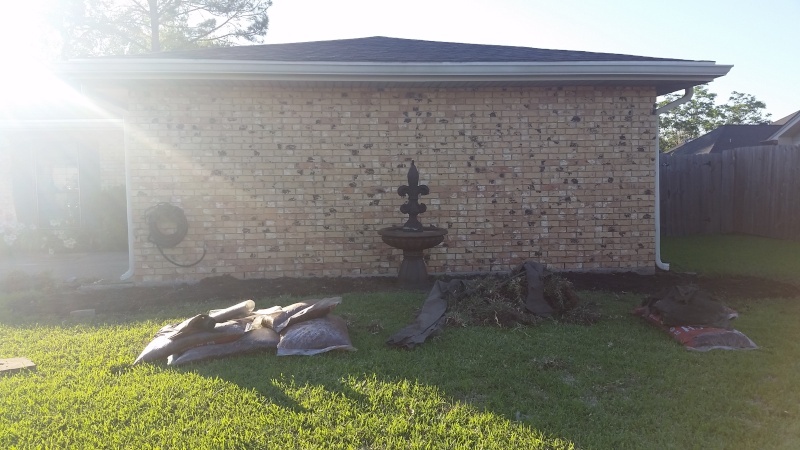 That also included digging up the grass that had made it's way into there (we have St. Aug grass so it was super thick) as well as created a better outline for the bed itself. Second day, we leveled out the bed and started placing the pavers to create a border. We laid paper down throughout the bed. 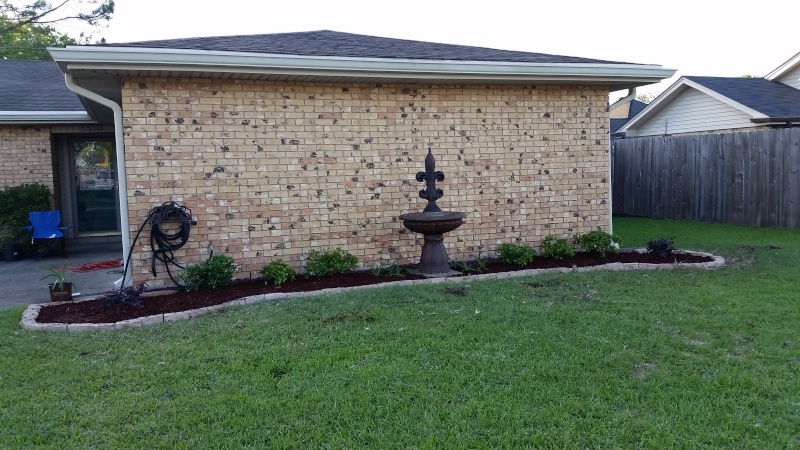 Also reinstalled the fountain on a solid and level base, then planted, and mulched. It was a lot of work. My efforts earned me a busted finger and sunburn on every appendage. I decided to go with hedges to make things easier. I am not good with upkeep and with the front of our house being a blank wall, figured it would add more to it than just putting flowers. I will be planting some things in front of the hedges but I am done with this thing for now. I went with Purple Diamond and Indian Hawthorne. I also went ahead and planted the Lily of the Nile I had in pots around the fountain and I hope they fill out and cover the base of the fountain nicely. It's definitely not nearly as nice as some of your gardens but I'm lazy and want as little maintenance as possible. Lol. Ashley - sometimes repetition of elements combine to make a simple, peaceful, understated elegance..I suspect that is exactly what you will get when your shrubs fill in. You have a lovely curve and the fountain is a strong statement piece. With how things grow rampantly in the south, have you considered putting some preen in the mulch? That looks really pretty, Ashleigh. You guys did a great job! Nice choice for low maintenance on the Indian Hawthornes, you won't have to touch them for years! Did you go pink or white? The whites seem to grow faster and bigger than the pinks so hopefully you got the pinks, LOLOL . I like that edging! Thank you! I lover an intricate garden with blooms and greens and textures but I am just not the person to maintain that. I've heard a lot of different opinions of the preen. Some say it works and some dont. I may get some and try it just to see because I'm sure in a few weeks the weeds will try to pop up. We got white, mostly because that was all they had. Lol. I would have liked to get punk though. I think they're prettier even though I'm not a fan of pink. I don't remember what the tag said on how big they grow but I think it's 4-5 ft? I'm going to try to keep them low though. So we'll see how that goes. Haha. And thank you. Border isn't perfect but it's good enough for me. And if I ever want to make it a little higher, I can always add a second layer. Yeah Ashleigh, they are an ideal hedge for a lower type of hedge. I have a couple pink ones in my yard as randoms for color and texture (and something I don't have to prune often, haha) but many of the properties that my company is responsible for use them as low growing hedges and they are beautiful! So 4-5 ft sounds about right. The white ones seem to grow faster and not as dense, but the leaves are cooler cuz the newer leaves (in its growing season) are a pretty bronzish color instead of the basic light green. Both are very pretty, though. I love the stackable type edging! You can do so much with them! You guys did an excellent job with this project! Ashleigh, the Preen will prevent weed SEEDS from germinating. If there are any perennial weed roots or root pieces left, they can still grow so would either have to be pulled, dug up or killed with weed killer. I have been reading that some people use corn meal to stop weed seeds from germinating. Much cheaper than preen but I haven't tried it to see if it works or if it's just some hullabaloo someone posted to pinterest to see how far it would go. I think I am going to try it this year. We are attempting to rid ourselves of crab grass. Ashleigh, you are lucky you get to have control of how your landscaping turns out. Most of what is at my house was there before we moved in and I have spent the last two years trying to get it to a lower maintenance design. I start out very gunho but as the season goes on my flowerbeds suffer because time and heat just kill my ability to get out there and keep them up. Every year my goal starts with doing one flowerbed or project per weekend and I do really well the first couple months and then life steps in and goes "nope, your roses are mine and you don't have the time to do anything about it, muhahahahah..."
On the boxes you intend to build in the back yard with mosquito deterrent plants, you might look into Lemongrass. I have a pot that I have had for a couple years now that I sit next to the back door during the summer and we rarely have too many issues with mosquitoes. I also have english lavender. The nice thing about the lavender is that it is drought tolerant and will carry over through winter on its own. The Lemongrass likes water and can't take the cold very well but it has good visual interest and works well. I tried the corn gluten meal thing as it had good early press but wasn't effective for me. This article from OSU reports similar findings - the original research was in a turf grass study and they are now postulating that the nitrogen in the corn gluten meal promoted dense turf grass growth that effectively shaded and crowded out any weeds. There are some tips for weed control in this article. Jenn - if you are finding summer too unpleasant for gardening (even up here, by July, I'm wiped and useless if its hot) you might want to try preparing your beds late fall (early winter, maybe for you...after things are thoroughly killed but before snow cover. Easy for me to say...sometimes a very narrow window ) This has been my goal the past few years but so far, something always interferes...our springs are too wet usually to get an early start so a fall prepared bed is the best. My favorite trick is a good thick layer of newspaper covered with mulch. And that is where the preen comes in for me - damn wind blown weed seeds germinate in organic mulch. So I sprinkle the preen in there...haven't done it since we've got Ami so I'm in a bit of a quandry...don't want the stuff on him but don't want the weeds either. And our place is just to big to rely totally on hand weeding/cultivation. very beautiful garden, cute plants in the front and nice choice in plants. very cool pool area. can't wait to watch it fill in, i have always loved the fountain so im glad you kept it. Saw the burns on FB, ouch! I need to redo the edging on our front beds this spring. I think i may rent a trench digger to get a good line VS. just cutting it out with a shovel, also hoping it will be faster! I always joke the damn grass grows into by flower beds but will not grow where i want it to. good weekend work there with you and your mom.